Compiled by Mark Gerry ~ With one last breath my best friend passed away tonight at 7:55 PM (Monday, August 18, 2008). With my hand on his head and Grandmaster Bob Maschmeier and Dan Tosh holding his hands and a room full of his black belts . . .
Sid Campbell’s achievements were numerous and the awards he received were will deserved. To begin with he was the founding President of the World Okinawan Shorin-Ryu Karate-Do & Kobudo Association, was the first American to open a Shorin-Ryu Shorinkan dojo in the United States. This auspicious authorization was granted by grandmaster Shugoro Nakazato in the early part of 1966. 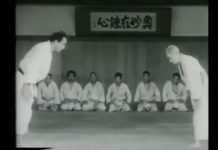 Henceforth; began a legacy that has earned Campbell an international reputation as being one of the true pioneers to introduce the “art” of karate to the Western world. In the past 40 some years Kyoshi Sid Campbell, 9th dan, has taught over 15,000 students and has been either directly, or indirectly, responsible for black belt rank awards being bestowed on over 800 martial artist who have earned these prestigious honors in the art of Shorin-Ryu (Kobayashi-ryu) karate-do. Today, Kyoshi Sid Campbell supervises over 48 schools in the United States and abroad. 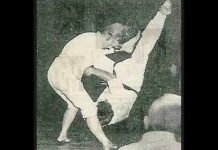 Soke Sid Campbell has been a featured inclusion in virtually every martial arts magazine in the world. 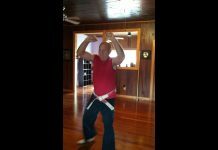 He has been chronically documented in dozens of Okinawan related text and historical books written by authors that specialize in martial arts publications. Among some of his most notable achievements include being awarded the Presidential Sports Award (by President Jimmy Carter) for instructing the armed forces, listed in Bob Wall’s Who’s Who in the Martial Arts, contributed to and listed in Who’s Who in Karate, inducted into the Professional Black Belt Hall of Fame, registered in the Who’s Who in the Martial Arts Elite, featured in The Men of Merit (International Biographical Centre, Cambridge, England), seated on the Board of Advisors for Horizon Publications, dedicated inclusion in the Knights of Heaven Brotherhood of Martial Artists (volume 12), on the Board of Directors of the International Tao of The Fist Martial Arts Fraternity, profiled in Marquis Who’s Who in the West, Who’s Who in the World, Who’s Who in Entertainment, Master Instructor (1993) World Martial Arts Hall of Fame, awarded the CRYSTAL AWARD (comparable to the OSCAR for Martial Arts) in the category of LIFETIME ACHIEVEMENT, featured inclusion in Contemporary Authors (volume 116), National Advisor to the United States Defense Tactics Association, retired vice-president of the United States Shorin-Ryu Karate Association, Director of the Pathways to the Orient Sports Academy, past Secretary of the Northern California Referee’s Association, featured in Who’s Who of American Martial Arts and Martial Arts: Traditions, History and People, Consultant to John Corcoran’s “The Martial Arts Source Book”, featured inclusion in the World Head of Family Sokeship Council’s The World Martial Arts Elite, a book of authorized Biographies, (First edition, 1999) and bestowed with the prestigious Golden Fist Award for Outstanding Okinawan Instructor. 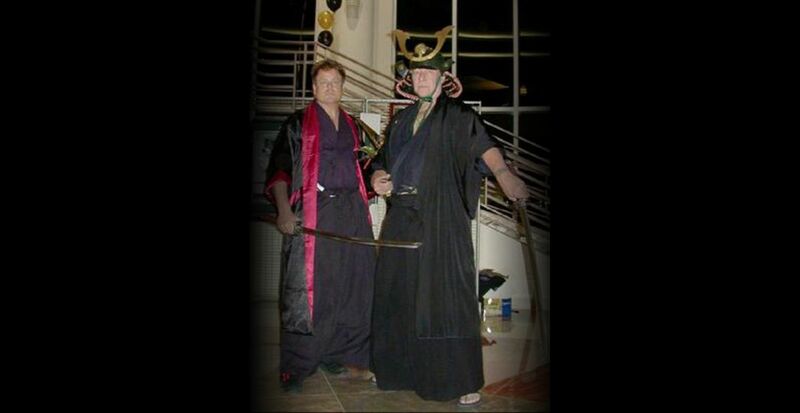 Sid Campbell is also on the Martial Arts Network Advisory Board for Chop TV, a distinguished member of the Board of Advisors to the International Congress of Oriental Medicine and Martial Arts, Creative Director for TRAC Productions and Co-Founder of the Kobudo Warrior Gear equipment company. He is also Co-Founder of the Islands Holding Company as well as a recipient of the Golden Halo Award bestowed by the Southern California Motion Picture Council. As a leading authority on traditional Okinawan and Japanese martial arts, Soke Sid Campbell has written over 50 books on various topics including: Ninja Shuriken Throwing, The Weapons of Okinawa, Shadows of Darkness; Secrets of the Night Fighter, Exotic Weapon’s of the Ninja, Kobudo Weapon Fighting; Techniques, Tactics and Styles, Balisong; Lethal Filipino Knife Fighting, The Mercenary’s Tactical Handbook, Kata; The Essence and Inner Meaning, Martial Arts Philosophy Made Easy, The Samurai Chronicles (Trilogy), Ancient Fighting Secrets of the Yin-yang, Weapons of Okinawa; A Devastating Kobudo Arsenal, Kobudo Weapon Fighting: Tactics, Techniques & Styles,Weapons of the Samurai. Bushiso Arts of War and numerous other titles. His short stories number over 200 and have been read by millions across the world. Cinematically, Soke Sid Campbell has been involved with the martial arts motion picture industry for over 20 years. He has written motion picture scripts which include “China Bomb”, “Falcon Claw”, “Wingless”, Bushwhackers”. He has appeared as an actor in Ninja Busters, Weapons of Death, Death Machines and as of most recent, co-starred with legendary kung-fu master Eric Lee in The Master Demon, Martial Medicine with Dr. Zee Lo and Chasing the Dragon. He has choreographed over 600 action fight scenes that have been seen in various martial arts films.In 1997 he was nominated for inclusion in the prestigious World Head of Family Sokeship Council. He also serves as an Expert Witness on Federal criminal cases (www.Sidcampbell.net) involving weapons and other items of a martial nature involved in the commission of Federal and State crimes. 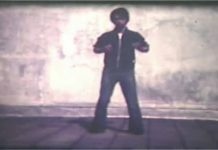 He has also been featured in numerous video instructional tape series including Super Nunchaku (beginner’s course), Super Nunchaku (semi-advanced course), Super Nunchaku (advanced course), The Tonfa Police Baton, Boots, Buckles & Blades; Practical Street Fighting Secrets for the Urban Traveler, Fist Load Weaponry; Awesome Tools of Self-Defense and produced Eclectic Escrima for Self-Defense. Many of his literary works and video productions are presently being converted to CD-ROM. He also wrote, produced and is the host of “Just For Kicks”, a cable formatted television program that features martial arts talent and guests. Shortly thereafter he was inducted into to MARTIAL ARTS GALLERY OF FAME. As of July 20th, 2002 Sid Campbell was inducted into the Martial Art Masters 2002 HALL of FAME in Newport Beach, California and on August 17th, 2002 he was awarded the LIVING LEGENDS AWARD for Martial Arts Historian at the Bob Wall Celebrity Roast in Burban, California. 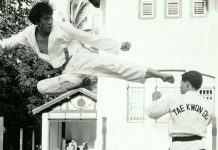 He is also of member of Worldblackbelt.com, an organization dedicated to the positive growth and unification of fellow martial artists worldwide. 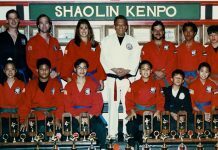 In 2002 he was elected as Vice-president of Oakland’s Dimond Merchant’s Association, the community of which he served and taught at his Honbu (headquarters) Shorin-Ryu Karate Studio. He is also the CEO (Chief Executive Officer), along with Chairman of the Board Eric Lee, of LEGENDS of the MILLENNIUM Corporation. It is the first and only action-martial arts theme restaurant chain concept to be developed. He is also co-author of The DRAGON and the TIGER…The Birth of Bruce Lee’s Jeet Kune Do Oakland Years with Greglon Lee (James Yimm Lee’s son) about the life and times of James Lee & Bruce lee when they were developing the foundation of what would become known to the world as Jeet Kune Do.